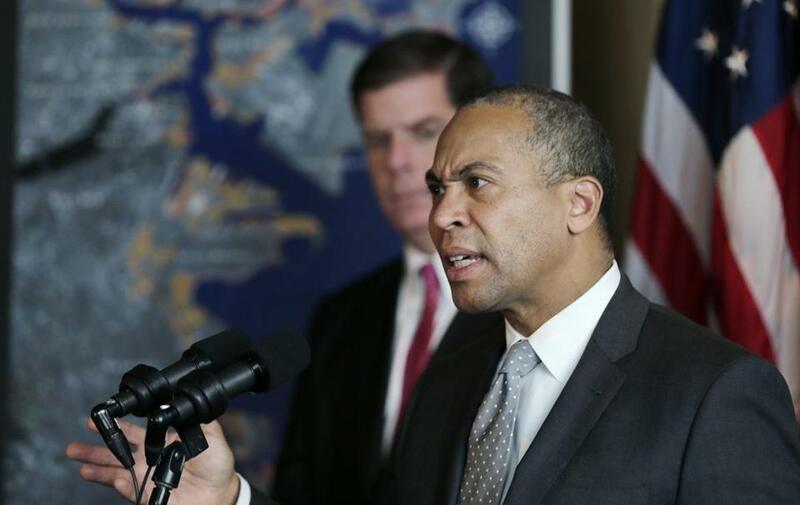 Governor Deval Patrick, joined by Boston Mayor Martin Walsh, announced a series of climate change initiatives Tuesday. Governor Deval Patrick, joined by Boston Mayor Martin J. Walsh, announced today a series of initiatives that aim to help Massachusetts better prepare for the effects of climate change. Noting recent nor’easters and other storms, and the arctic freeze that gripped the nation, Patrick said his $50 million plan would assess and address vulnerabilities in climate preparedness in areas such as public health, transportation, energy, and business. The plan includes a $40 million grant from the Department of Energy Resources that will enable cities and towns to strengthen protections around energy services. The governor will also invest another $10 million in critical coastal infrastructure and dam repair, including $1 million in municipal grants to reduce or eliminate risks associated with coastal storms and sea-level rise. During the press conference, Walsh — who trumpeted climate change when he was in the Legislature and on the campaign trail — made his first appearance with Patrick since becoming mayor. He also reunited with old legislative colleagues, and state Representative John Keenan of Salem lauded Walsh and his predecessor, long-serving Thomas M. Menino, for their work on the issue. “Governor, if it weren’t difficult enough to replace a mayor who not only walked on water, now he’s expected to stop sea-level rise,’’ joked Keenan, a Salem Democrat. Addressing the crowd, including swarms of reporters following his every move, Walsh said the city recently released a report examining weak spots in responses to climate change problems and areas of high priority. “My team and I are reviewing the report closely, and I’ll be making some announcements in the coming weeks and months about the actions we will take in making Boston better prepared for the next superstorm,’’ said Walsh. Since 2010, Massachusetts has been battered by five storms, including a sideswipe by superstorm Sandy. There have been vector-borne diseases: In summer 2012, the state saw a spike in the incidences of Eastern equine encephalitis that led to aerial spraying, the governor noted. And last year, oyster beds had to be closed for the first time in state history because of the bacterium vibrio parahaemolyticus, Patrick said. Under Patrick’s plan, the state’s Department of Transportation will assess the vulnerabilities of its facilities and develop climate adapatation plans by 2015. The Department of Conservation and Recreation will work to quantify how its historic parkways and roadways would be affected. And the Department of Public Health will work to identify areas of special concern among local health boards, many of them ill-equipped to handle the consequences of changing climate, Patrick said.